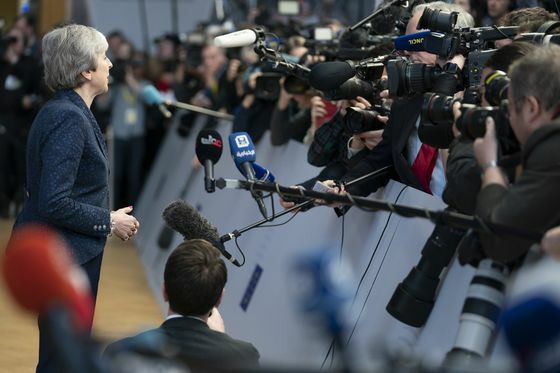 European leaders maneuvered to stop a chaotic no-deal Brexit happening next week, handing the U.K. an extra two weeks. The cliff-edge that investors were dreading has been postponed -- but a new cliff-edge loom on April 12 when the U.K. will have to decide on the way forward. EU President Donald Tusk said U.K. Prime Minister Theresa May had accepted the bloc’s plan to avert a potential cliff-edge Brexit next week. The new key date is April 12, when the U.K. must decide if it will take part in European elections and potentially accept a long extension if May hasn’t persuaded lawmakers in London to back her divorce deal. French President Emmanuel Macron wanted to avoid a last-chance summit next week with a parliament vote Wednesday, summit Thursday, and potential cliff edge Friday, according to a French official. Such a scenario could have led to a panic extension, the official said. Instead, the British will be expected to table credible plans before April 12, with the EU keen to avoid deadline summits. It’s up to the U.K. now to avoid a crash-out Brexit, according to the official. The EU has offered the U.K. an unconditional delay to Brexit day, avoiding a crash-out scenario next week, according to the summit communique. Britain has until April 12 to decide what next. If it gets the divorce deal passed, then the extension can last until May 22. No-deal has been avoided, but another cliff-edge looms. Markets were getting edgy as the March 29 approached. 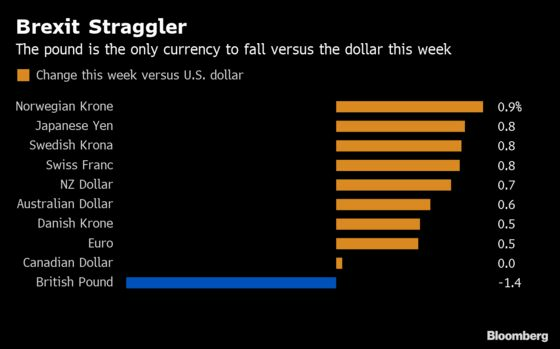 The pound was flat.